Those of us who are artists have lots of aunts and uncles to thank for what we do. I tend to claim anyone who’s had a measurable effect on my creative life that way. It provides what might be a false intimacy, but it accurately reflects the way I feel about those writers, filmmakers, musicians and visual artists who have given me some inspiration and/or motivation along the way. The man pictured above is one of them. His name is Ray Harryhausen, and he is generally regarded as the greatest stop-motion animators to ever have his work committed to film. If you’re not into the movie (particularly fantasy and science fiction) version of inside baseball, you probably don’t recognize him or his name, but you’ll surely recognize his work. Talk about shock and awe. I remember being stunned by the special effects, then even more stunned when, as an older kid, I learned how they were achieved – small models where moved a tiny fraction, then the movie camera shot a frame. The Little Theatre, still holding down its original spot on DeKalb Street in Camden, S.C.
That process was repeated thousands of times until, when run at regular speed, the film gave the illusion of the model actually moving on its own. 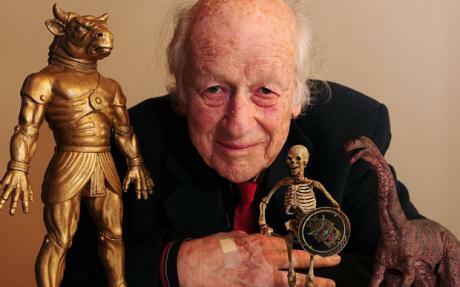 Ray Harryhausen died last week at 92, and left an enduring legacy of inspiration that hundreds of other behind-the-scenes film folks should envy. Guys like George Lucas and Steven Spielberg – no slouches in the special effects movie department, cite Uncle Ray and his work as major inspirations. And really, who couldn’t be inspired? I’m one of the gazillions of kids who even tried to reproduce Harryhausen’s work in our own small fashion. After getting a Super 8 movie camera as a Christmas gift when I was 10 or 11, I quickly went to work creating stop-motion movies of my own with Lego astronauts and cardboard backdrops painted black, hole-punched and back-lit to represent the inky void of space. For a long time now, computer generated images (CGI) has taken the place of stop-motion animation in rendering fantastic monsters on the big screen, for better or worse. And I’m sure new generations of computer animation and effects efforts are being inspired with each new summer blockbuster or superhero spectacle. But I can distinctly trace back to Harryhausen a couple of traits that worked for me later in life and, specifically, as a writer. If you’ve ever actually tried to do stop-motion animation, the thing it perhaps requires most of all is patience. Creating 30 seconds of screen time can take days in the studio, so there’s really no way to rush. Rushing, in fact, would equal disaster. As a result, through my own little Lego efforts, I learned to take it slow and do it right. There also is a certain amount of obsessive compulsive disorder that goes into being the kind of perfectionist that works in such a slow medium. I’m not sure if that was built into my psyche or developed later, but having a little OCD never hurt a newspaper copy editor, either. I met Mr Harryhausen in 1993. He spoke about how he worked most of his magic while sitting by himself in his garage — such a difference between that and Mira-max Studios! I shook his hand and told him that when I watched EARTH VS. THE FLYING SAUCERS from a theater balcony in the 1950s, my cousin Frank sat beside me, targeting the folks below by shooting dried peas from a plastic tube. The patrons thought that they were involved in the invasion on the screen!